She's asked your crew to investigate as a matter of priority. As the host of this event, you will prepare the game before your crew arrives. Your role is like the Game Masters you're used to from other Escape Rooms. Once players arrive, you'll do a quick intro and keep things running smoothly, as they're likely to turn to you for guidance. Don't worry there's a Case File with hints and solutions for every puzzle. Customizing the escape game (optional). What to do when players arrive. If you plan to play the base game without customization, you can jump directly to Printing the Game. However, if you enjoy creating custom puzzles, you can easily edit the game using the Builder’s Kit included in the download. This is easier than it sounds, since the entire game is built using MS PowerPoint. 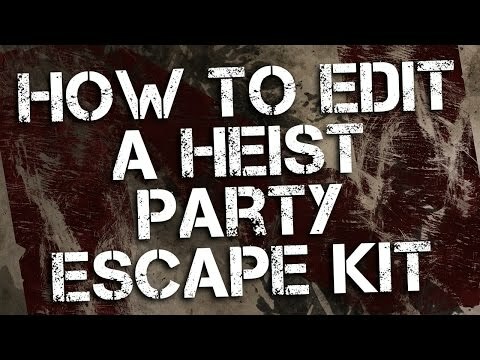 If you're comfortable editing a Word document, you have all the skills you need to become an Escape Room Designer! Just click on the Designers Guide folder inside the game download. Then open the Designers Guide.pptx file. For a full guide, check out the Mods page. Open the Designers Kit PowerPoint. Mix and match elements or combine with real-world props, such as padlocks. For example, you could replace the last 2 puzzle sheets with a real 3-digit combination lock or safe. Open the PDF file Game - Mr George.pdf and print the escape kit on standard paper. It's sized for US paper sizes but will still print on international paper (A4). There's no need to use high-gloss paper or professional printing, since the gritty style looks almost identical either way. Using thicker paper does add a nice touch, but again, it's by no means necessary. The game is designed for teams of 2-4 players. 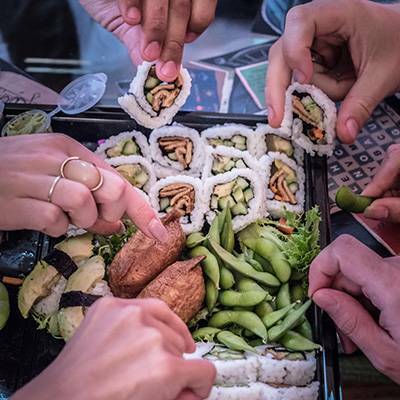 If you have a larger group, though, don't despair! Just print the kit out several times and run the game as a competitive team event. 4-6 players = print once. 7-12 players = print two to three copies. 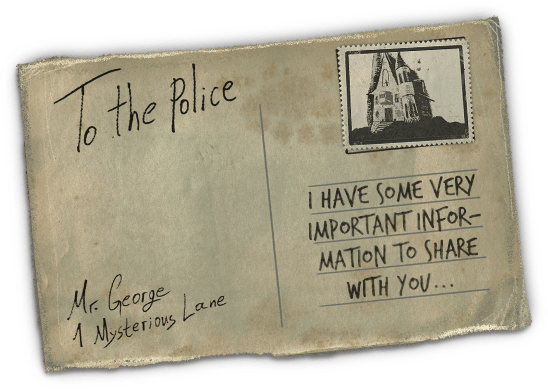 The Disappearance of Mr. George escape kit also includes optional posters and party invites to make the experience even more immersive. None of these are required to play the game, but if you want to go the extra mile, it’s totally worth it! To print the posters just open the pdf under Posters folder. You'll most likely only want a few of them, so when you click print, type in the slide numbers for your favorites separated by commas. Separate slide numbers with commas. You can edit and share the invites on Facebook, Instagram, and other social media. Or you can go old school by printing them and sending them via snail mail or physically handing to your crew. You'll find these in the Invitations folder. To edit, open the PowerPoint file and customize whichever invite you like the most. These are perfectly sized to be printed as normal 4x6 photos (the small photos people always print). 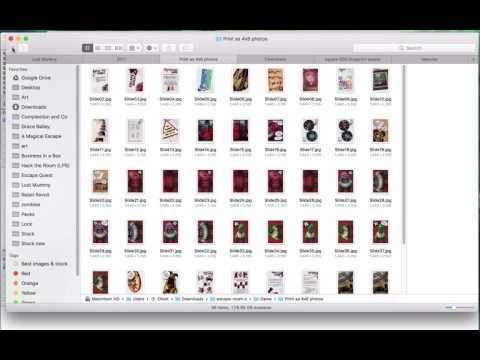 Choose the JPEG file format and save every slide. This will export all of them as photos, so delete whichever ones you don't want. From here you can print your invitations as photos with a photograph printer (or by putting them on a USB drive and taking them to a local photo service). Alternatively, just share the the digital images online. 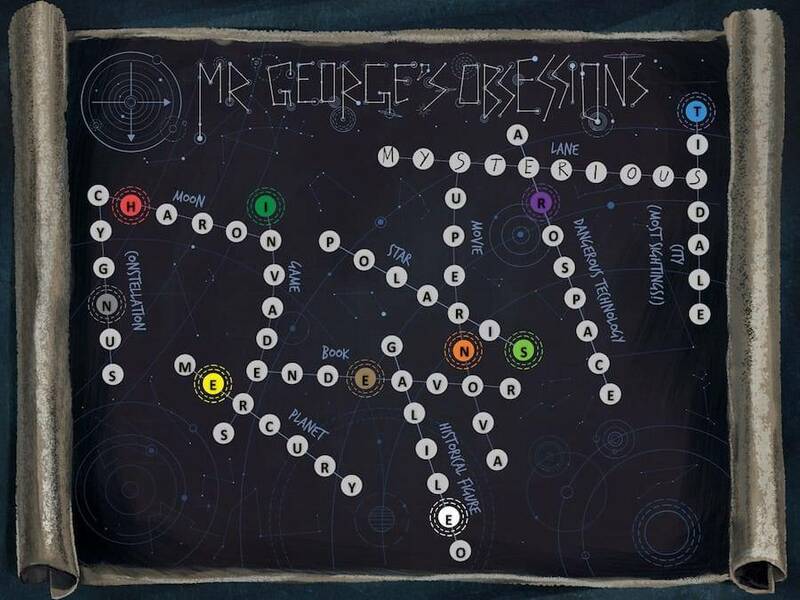 The Disappearance of Mr. George requires players to solve 10 challenges and combine the results into a star map that reveals a safe combination. Place all the puzzle cards in the middle of a table. Set aside the last 2 pages (11 and 12). You'll read page 11 when the game begins. You'll look at the last page when your team feels you have the combination. 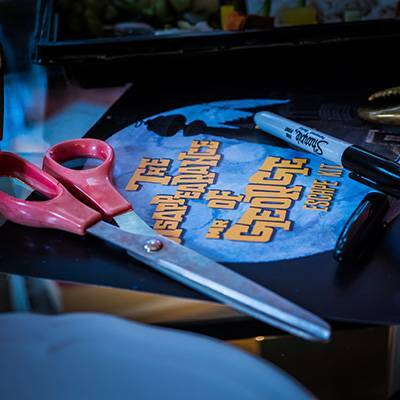 Grab some scissors, blank paper, and pens (permanent markers write best on the full-color sheets). Find the puzzle sheets that contain 2 puzzles and cut them in half. Place these and the full-page escape puzzles in logical spots around the room. 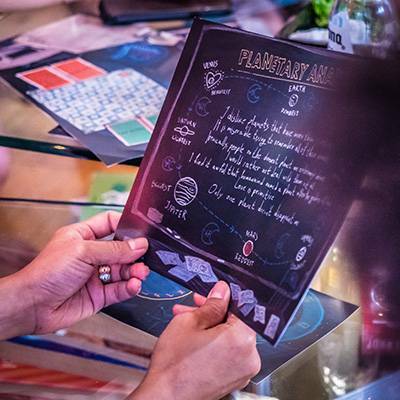 For example, the Chalk Board could be stuck to a wall and the Boardgame sheet placed on a table. SPOILER ALERT: Clicking here will show the solutions to all game puzzles. No joke ... if you scroll down you'll see the solution to every puzzle in the escape room kit. Proceed only if you're the game master, and you're not going to play the game. If you're just looking for hints, here's the Case File. Tap here to open a larger version in a new window. 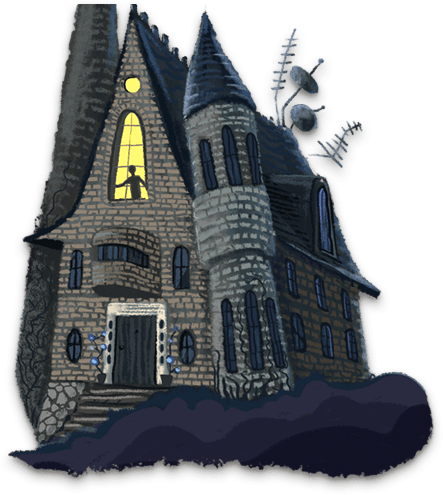 What's going on: Explain how escape rooms work, since they're still a new experience for most players. A good 'hook' is asking if anyone's played a digital escape room app. 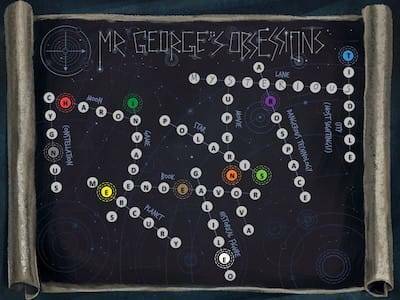 How to solve puzzles: Explain that there are 10 challenges to solve, with the answers being written onto the Star Chart to uncover the combination of the safe. Last two pages: When the team agrees they have the combination, they can look under the cover page (red stop sign) to see if it's correct. If playing with teams: Appoint a team leader. Teams race to finish first. Deduct 5 minutes for every hint used. Nobody has any last minute questions? Go ahead and run the intro video in the Case File. Then start the background music and get ready for the fastest hour of your life! Note that the custom Spotify Playlist lasts exactly 1 hour, so it serves both as an atmosphere enhancer and a game timer. When the music stops, time's up!